A group of Everest expedition companies lead teams of people trying to reach the summit of Mt. Everest up the mountain. As if the climb wasn't difficult enough, an unexpected blizzard threatens the lives of everyone trying to complete this difficult adventure. 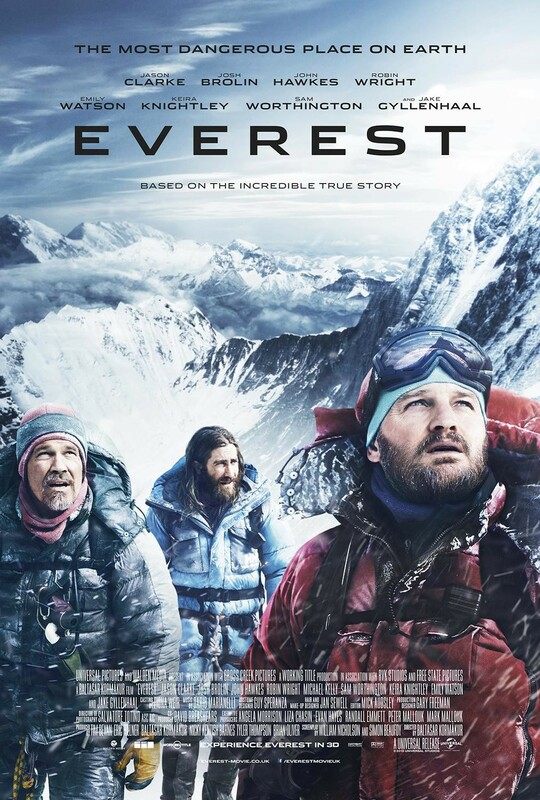 "Everest" tells the true story of a 1996 expedition to the summit of Mt. Everest that faced tragedy when a blizzard hits the climbers mid-climb. The film boasts an impressive ensemble cast featuring the likes of Jason Clarke, Jake Gyllenhaal, Josh Brolin, Emily Watson, Sam Worthington, Michael Kelley, Keira Knightly, Robin Wright, and numerous others. It features fantastic expansive shots of the frozen mountainous landscape on Everest. These shots and the cinematography in general are, of course, beautiful and breathtaking. It's crazy what filmmakers can do with special effects these days. They are able to capture what we would imagine a realistic trek up Everest would look like as if we were there ourselves. The movie does it best to remind us of the dangers of the climb, from the most obvious worry to the smallest possibility of things that could go wrong. It opens with a blurb telling the audience how many professional climbers have died attempting the climb, as well as a background of the commercialization of the expeditions in the early 90's that allowed more amateurs to attempt such a difficult venture. Before the teams start the actual climb, we get quite a bit of exposition from the head of the New Zealand expedition team, Rob Hall, played by Jason Clarke. He makes speeches, detailing step-by-step what goes into the climb, how many ways you can die, how that dying would take place, and how reaching the peak will make you automatically begin to die. So, just in case you weren't sure about it going in to the movie, you certainly know by the end of the opening act that climbing Mt. Everest is a dangerous endeavor. From there, Hall and his team, as well as several other foreign expedition teams of climbers begin the harrowing journey to the summit of Everest. However visually pretty "Everest" might be, there are a couple of glaring negatives, too. There are some overly fake looking CGI moments, and though these instances are few and far between, they are painfully obvious when they appear on screen. Also, the pacing of the film can get dreadfully slow despite its assurance of an action-packed, thrilling time. It has many points where the film simply drags and drags, as if the movie itself were trying to trudge uphill through the snow and ice, not just its characters. And speaking of its characters, many of them are simply wasted. For such a large, impressive cast of many talented and well known actors, many of them are almost entirely pointless and are only in one or two scenes. They play filler roles that could have been performed by essentially anyone else and without a hefty price tag. Finally, for a topic with such a formidable, foreboding journey, "Everest" is almost completely devoid of any tension. Overall, there is a great visual spectacle to "Everest," but it falls short in the character and storytelling departments, which means this movie isn't really worth your time. Nine times out of ten, we'd probably choose to watch a documentary about this subject than the film. One year ago, we were watching: "Paper Moon"